Looking for a professional gift for your boss, a client, or a co-worker while staying within a budget? 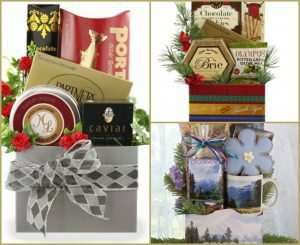 Gourmet food gift baskets are a classic, professional, and delicious way to celebrate the holidays and show your appreciation. Here are three corporate Christmas gift baskets that, with standard shipping of course, will cost you under $80. This Classic Gourmet Gift ($57.99) has all of the luxurious treats that you’d expect in a gift basket. Caviar, smoked salmon, cheese, and crackers make up this beautiful, silver gift basket. Your recipient will love treating themselves to the contents of this gift! Give the gift of savory and sweet tastes with the Thank You at the Holidays basket ($44.99). This gift has a mix of chocolate cookies, sesame crackers, brie cheese, and olives to satisfy even the pickiest of palates. It’s the best (and scrumptious) way to say thank you and happy holidays! Send a unique holiday greeting with this Colorful Colorado gift ($57.99). This basket includes characteristic Colorado gourmet favorites such as popcorn mix, hand decorated cookies, and coffee. Also included is a mug that shows off the beautiful mountains of Colorado. They’ll love these treats as much as the wrapping they arrive in! No matter who you’re shopping for, finding a professional gift for any budget is possible when shopping on BisketBaskets.com. Shop our selection of corporate Christmas gift baskets today to get them to your recipient in time for the holidays! Does someone on your shopping list have a sweet tooth this holiday season? 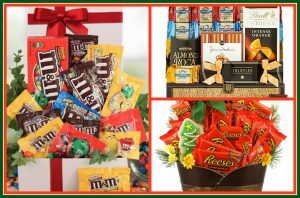 Bisket Baskets has you covered with a few different candy holiday gift baskets that they’ll love! Reese’s peanut butter cups are a huge hit at any time, so send the candy lover in your live this massive Reese’s Christmas Gift Basket! Packed with different sizes of delicious peanut butter cups and a delicious royal iced cookie, they’ll be snacking on this gift for weeks to come. Have someone who is obsessed with M&M candies? M&M’s Christmas Care Package will be the highlight of their Christmas! This box has a huge assortment of different sized and flavors of M&M’s. They’ll find their favorite kind and maybe a few new ones too! Finally, for the more grown up candy consumer, send the Chocolate Decadence box. This reusable keepsake box is filled with an assortment of gourmet chocolates and treats. They’ll have every reason to indulge in a sweet, chocolatey candy this holiday season! For more ideas on holiday gift baskets, visit BisketBaskets.com today! We have a wide assortment of candy, gourmet food, and pet gift baskets that are perfect for everyone on your list. Shop today so you make it in time for Christmas!